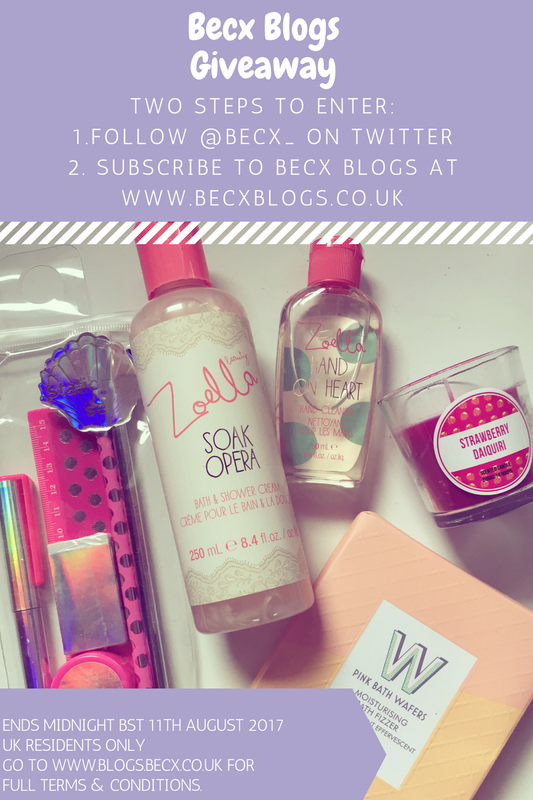 Becx Blogs: GIVEAWAY - A Month of Blogging - THANK YOU! Hey guys! So it's been a month since I started my blog and I'm so overwhelmed with the support and kindness of everyone who has subscribed, read and commented on my blogs. Not to mention all the support over on Twitter and Instagram! As a thank you, and a small celebration, I wanted to host my first Giveaway! I'm excited! Here are all the details! Please make sure you read the full terms & conditions before entering. Giveaway open to UK residents aged over the age of 18 only, or over the age of 16 with parental consent to give your address out. You must email subscribe to Becx Blogs, at www.becxblogs.co.uk, in the top right corner. No purchase or payment required to enter. Please allow 8-10 business days for your prize to be dispatched and delivered. This is a single bundle prize, there is only one to be won. Includes: Zoella soak opera, Zoella pink bath wafers, Zoella hand cleanser, Mermaid stationary set, and a Strawberry daiquiri scented candle. The prize is not redeemable for cash or exchange. Entries close midnight BST on Friday 11th August 2017. Winner announced via Twitter. Winner must contact me through Direct Message to give their address.